There’s a few ways you could do this. Give choices such as “Which bracket does your age fall into <18, 18 < > 70, < 70”. Then you can use the users answer to decide whether the user is in the right bracket and can move forward through the bot using filters. Ask for the users age and then filter the next actions based on age is greater than 18 and age is less than 70. 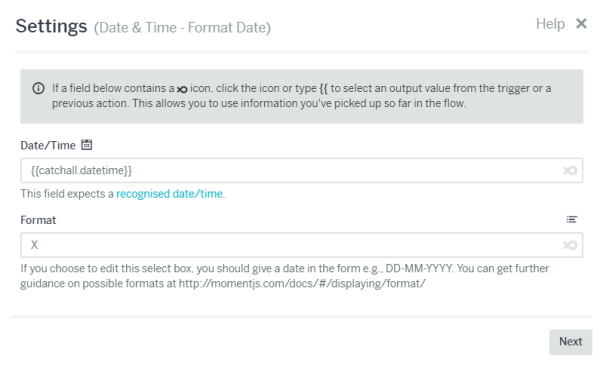 Ask for the users date of birth and use the Date and Time Service to calculate the age. Again the next actions would need a filter based on age is greater than 18 and age is less than 70.
is there a template about it? The first two options that Karen shared would be the easiest way to handle it. You can just ask for an age in a question and then use filters to control how the flow should progress. For the third option you can calculate a person’s age by using a combination of the Date & Time Service and the Number service. Now we have today’s date and time converted into seconds we can do a calculation to work out the year value. You’d then repeat these two actions for the date of birth provided by the user. Use the current date/time and a date of birth to calculate an age. Once you have the age you can have a filter setup to check whether it is greater than or equal to 18 to know if they’re of the right age. Hope that helps! Please let me know if you have any questions.